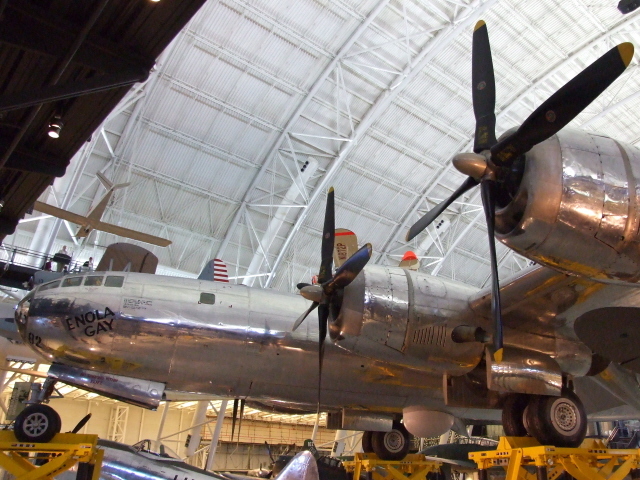 This is the original B-29 bomber plane that dropped the atomic bomb on Hiroshima – now an exhibit at an aviation museum at Washington Dulles Airport. More background info: The A-bomb attack on Hiroshima, Japan, carried out by the USA's "Enola Gay" B-29 bomber, changed the world forever – not only did it more or less wipe out that Japanese city in an unprecedented manner, it was also the beginning of the atomic age, which during the Cold War could have heralded the end of the world. As such this one plane could hardly be of darker significance. In the USA the dropping of the A-bomb is widely seen as good thing, though, as it allegedly helped in shortening the final stages of WWII in the Pacific, thus saving hundreds of thousands of lives that may otherwise have been lost in a land invasion of the Japanese homeland. In Japan it's seen somewhat differently, as you might expect. For more on the decision to drop the bomb and the validity of various pro and counter arguments see under Hiroshima and Nagasaki. After WWII, the "Enola Gay" remained in service for a while, and also took part in Operation Crossroads in Bikini (although not in the role of dropping another bomb), but soon after that she was decommissioned. It was, however, decided early on that she should be preserved. So in 1946 she was handed over to the Smithsonian Institute. For decades she was moved from one storage facility to another – always out of public view – where she also underwent major restoration work in the 1980s. 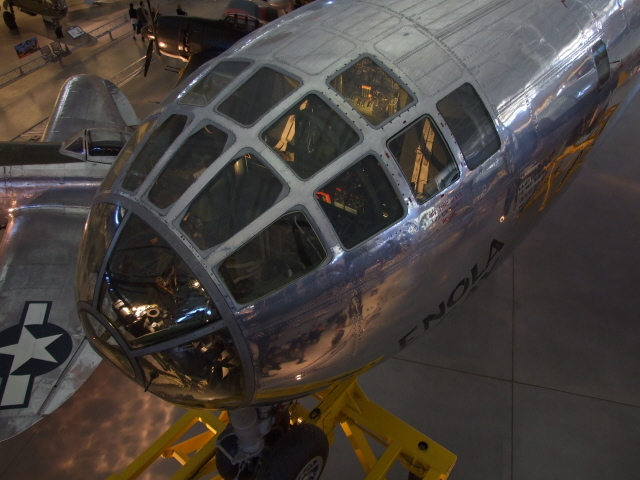 When in 1994 a first public display of (only the nose part of) the "Enola Gay" was set up by the Smithsonian Institute's National Air & Space Museum on the National Mall in Washington D.C., this created such controversy that the museum's director was forced to resign and the exhibition had to be radically reduced and eventually called off altogether. The cause of the controversy was not the display of this infamous piece of war machinery as such, no, it was the fact that the surrounding exhibition allegedly focused "too much" on the devastation the bomb caused. Presumably, certain interest groups wanted the act portrayed in a more positive, more "patriotic" light. 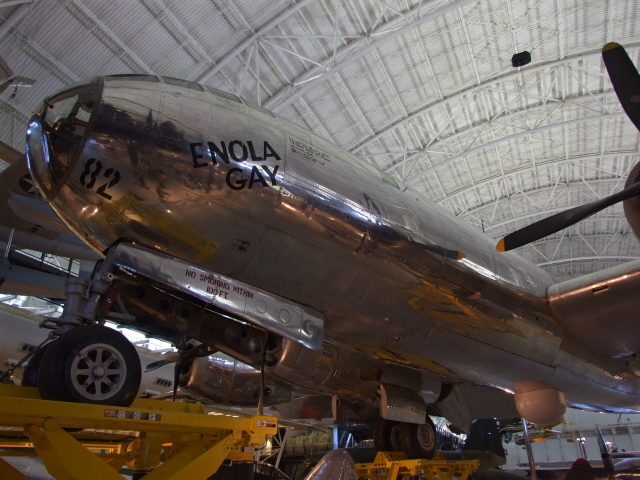 Meanwhile, the fully restored "Enola Gay" can be seen at the Smithsonian. But not at the Institute's downtown Washington main branch Air & Space Museum, but at the new Steven F. Udvar-Hazy Center branch out at Washington's Dulles International Airport. To avoid any controversy, the plane is now simply treated just like any of the other 100 plus objects on display, i.e. with a focus more on technical specs and without much comment on why it is such a dark exhibit. So you have to use your imagination (and background knowledge) to get a full feel for its sinister aura. 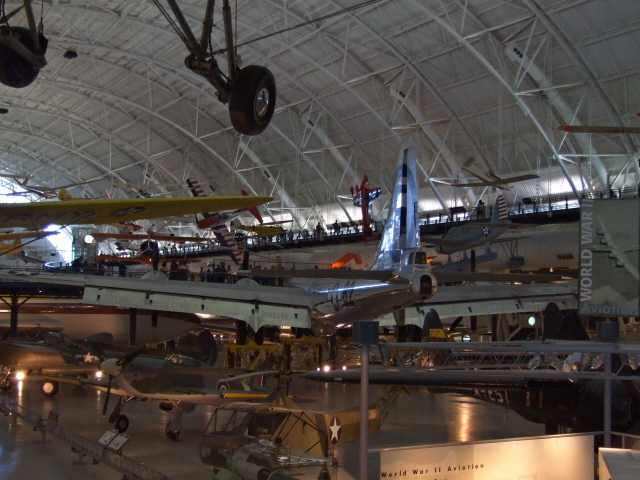 The Udvar-Hazy Center, by the way, is a fairly recent addition to the Smithsonian, opened in 2003. It had become necessary since the original museum on the Mall was already chock full and could never have housed complete planes of this size anyway. The somewhat strange name of this museum branch was taken from its main sponsor, a billionaire aviation businessman of Hungarian descent, whose initial 65 million dollar donation made the construction of the museum possible in the first place. What there is to see: The plane as such wouldn't really stand out if it wasn't for its history. It is quite big, OK, but there are bigger ones in the museum (even a Concorde). Its silver, cigar-like fuselage body is arguably also not particularly pretty compared to many a different aircraft type. On the port side just behind the cockpit there's the name in simple black letters (no additional decorative painting such as on the "Bockscar"). You can see it from ground level, i.e. from below. The plane stands slightly elevated on yellow platforms – but is cordoned off, so you can't walk under it. Or you can see it from a gallery walkway that leads past it at just a little higher elevation than the cockpit so that you can peek inside. To understand the dark significance of this unique object you have to know a bit about its history before you get to see it here. The museum doesn't exactly rub your face in it. OK, there is an explanatory text panel that briefly mentions the "Enola Gay's" special role, but otherwise the effects of the first A-bombing of a city in history is not dwelled on in any detail at all. It is thus not easy to fully grasp the dark aura that this aircraft potentially exudes (or should exude). In fact, this may completely pass by many a casual visitor who's not previously been aware of the "Enola Gay". I've witnessed kids who only at a second glance grasped it – to much jubilation, as this is clearly something really thrilling. While the "Enola Gay" is without any doubt the prime reason for a dark tourist to come here, there are also a couple of other objects on display at this museum that also fall within the dark category. 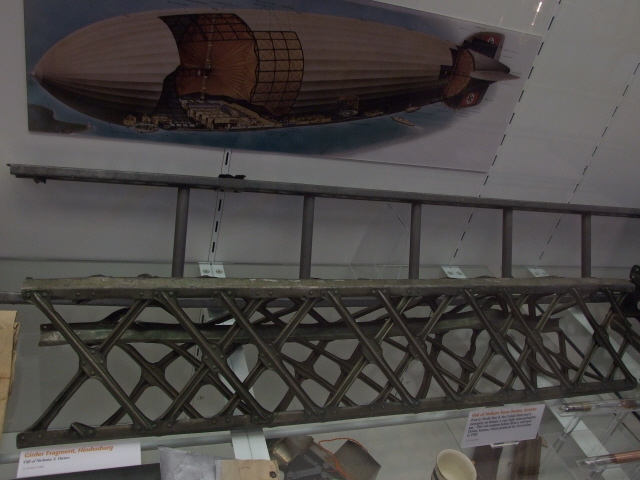 For example: a piece of fabric and a girder fragment from the Hindenburg. The Vietnam War section contains some small but noteworthy items, e.g. : a pair of "Ho Chi Minh"(-type) sandals, as worn by the Vietcong, pieces of brick and an inmate's pyjamas from Hoa Lo prison (the infamous "Hanoi Hilton") and a "Dog Doo"-camouflaged transmitter dropped by the CIA on the Ho Chi Minh Trail designed to warn of traffic movement! Of the aircraft on display, an F-14 that was involved in a shoot-down clash with MiG-23s in the Gulf of Sidra near Libya in 1989 may be of somewhat darkish interest, as may be the juxtaposition of a Vietnam War MiG-21 and a US F4 "Phantom". In the WWII section, there's a Japanese "Ohka" ('cherry blossom') manned flying bomb designed for Kamikaze missions (cf. Yushukan, Tokyo), which is particularly noteworthy also as this model is the only surviving specimen of the longer-range jet-powered "22" version (most others were short-range rocket-powered "11" versions). In the space section, an early Regulus nuclear cruise missile may also be of somewhat dark appeal. But the rest of the museum is really more for aviation buffs and military enthusiasts, though some of this may also still be worth a quick look. Highlights include an SR-71"Blackbird" reconnaissance plane from the Cold War era, at well over Mach 3 the fastest jet airplane ever, the only surviving Arado Ar-234 Blitz, the world's first jet-powered bomber, captured from the German Luftwaffe in Norway, an Air France Concorde, and so on and so forth. In the space section the bulkiest exhibit of them all is the Space Shuttle "Discovery" (this moved into the museum in 2011; when I was there in 2010 the shuttle on display was still the prototype "Enterprise" … apparently the choice of name was mainly brought about through public pressure – people wanted it to bear the name of the fictional spaceship of "Star Trek" fame; although there doesn't seem to have been any pressure to rename the shuttle's commander James T. Kirk). Location: inside the Steven F. Udvar-Hazy Center branch of the Smithsonian Air & Space Museum, located south of Washington's Dulles International Airport. (Strictly speaking it is thus not actually located in D.C. but on the territory of the state of Virginia. But it's categorized under Washington here as it's still located within the greater Washington area, and is, for most tourists, best accessed from the city, and is also associated with one of Washington's prime sights.) The exact address of the Center is: 14390 Air and Space Museum Parkway, Chantilly, VA 20151. Access and costs: a bit tricky to get to; free admission, but a hefty parking fee. Details: to get there from downtown Washington D.C., you either need a car or you have to embark on the complicated journey by public transport. It's a bit long-winded, but still at a combined cost of ca. 7 USD return a lot cheaper than the hefty parking fee of 15 USD at the museum (or arrive after 4 p.m. from when parking is free). Driving to the museum should take a lot less time, but can turn out tricky. When using a SatNav (GPS) you'll probably be fine finding the place, but without, like I tried to do it, it can be hell. I got so lost at various points that what should have been a 15-20 minute drive from National Airport turned into a 2 ½ hour odyssey. It's definitely best to avoid going via Dulles Airport as such (on the Interstate/toll road) and instead to use the southern route via Highway 50 south of Arlington and then Highway 28 north at Chantilly (from where the museum is signposted). Once you've made it to the entrance of the museum and have passed through the security checks, you'll find the "Enola Gay" roughly in the centre of the complex as you make your way straight ahead from the entrance, head a bit to the left: it's in the middle of the WWII Gallery. Look out for the big "R" inside a black circle on the silver tail of the plane. While getting to the museum is tricky and parking expensive, admission to the actual museum is free (as it is part of the Smithsonian). Opening times of the museum: 10 a.m. to 5:30 p.m. every day (except Christmas Day); in the summer (28 May to 5 September) it stays open for an extra hour. 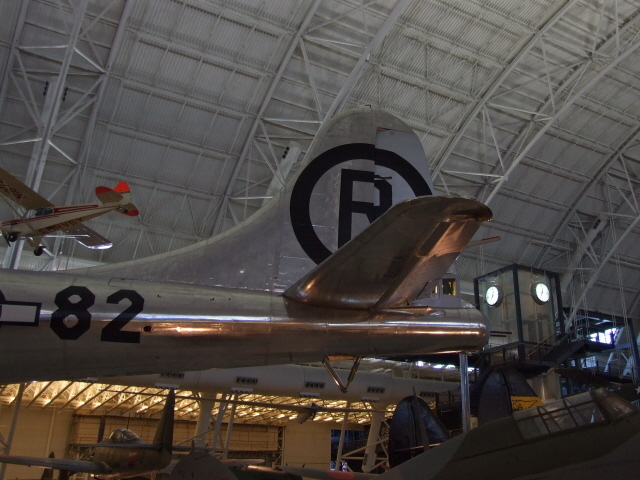 Time required: For just a good look at the "Enola Gay" and brief look around the rest of the museum something like 45 minutes may do – if you want to go deeper into everything the museum has to offer, you'd better allocate a couple hours more. Combinations with other dark destinations: most easily all the dark sites in Washington D.C. itself – although it is also possible to slot in a visit to the Udvar-Hazy Center, for a peek at the "Enola Gay" and a quick walk around the museum, when driving down to the Greenbrier … that's what I did, though I also planned in a stopover halfway (namely at Luray), but if you set off early enough, that may not be necessary. Further afield, the USAF Museum in Dayton, Ohio, has the Enola Gay's sister bomber "Bockscar" that dropped the second one on Nagasaki. Combinations with non-dark destinations: in particular see under Washington D.C. – further afield, there's the beautiful Shenandoah National Park about an hour's drive west of Dulles Airport (see also under Greenbrier).